Whatever style of kitchen you've chosen, whatever type and colour of kitchen doors you have, Lark and Larks has an extensive range of kitchen worktops to match your decor. Whether you're looking for ultra modern, or prefer a more traditional country cottage look, we can supply gloss, stone, slate, wood or marble finishes in laminate, solid acrylic surface and solid wood designs. Our kitchen worktops are available in a number of widths and lengths so they are ideal for unit run and breakfast bar or peninsular applications. When it comes to kitchen worktops, looks should only be part of the equation. There are a wide range of products available including laminate worktops and solid wooden kitchen worktops but choosing the right one for you is more than just a matter of looks. You need to have an idea of what your worktop will be used for and whether the material you have selected will be able to manage the job. As a starting point, most people seek a surface that is stain and heat-resistant while also being extremely durable, easy to clean, and reasonably priced. Finding a worktop that satisfies all requirements can be challenging so it is important to define priorities. Timber kitchen worktops can be simply stunning. However, maintaining the stunning looks can prove to be a challenge without proper care and regular maintenance as they can be prone to deterioration. But that’s not to say that there aren’t any good quality products that can last. Owners must simply be aware of the regular maintenance involved in order to avoid disappointment. For an economical choice, laminate worktops are some of the toughest and cheapest products available on the market and many look incredibly sharp and stylish. With Lark and Larks extensive selection of quality kitchen worktops, finding the right solution for your kitchen should be no problem at all. From ultra-modern to traditional country cottage looks, we have a wide selection of high gloss, stone, slate, wood and marble finishes in laminate as well as solid acrylic and solid wood designs. Our kitchen worktops are available in an extensive range of sizes to suit a variety of purposes. Whether you select a top of the line product or an economical choice, your kitchen worktop will be a centerpiece of form and function. That is why it is essential that you match the right material to the right purpose. Acrylic worktops are also known as solid surface countertops. They are constructed by layering a thick piece of acrylic over a plywood substrate or particle board. One popular reason that homeowners select acrylic is because of the ability to integrate an acrylic sink into their kitchen design without any seams. 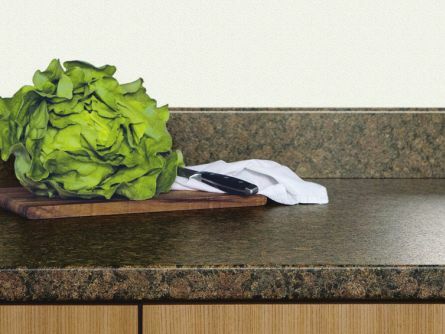 One of the greatest benefits of choosing acrylic is that the worktops are non-porous and highly stain resistant. Should a stain appear, it is relatively easy to sand it out. The acrylic worktops are incredibly durable and easy to clean withstanding even the most abrasive cleaners. Should you have an accident that leaves any scratches, holes, or burns, most worktops can be professionally repaired. What people often dislike about acrylic countertops is that they sometimes appear “plastic looking” and the price tag is often on the higher end of the scale putting them out of reach of many home improvement budgets. They are also vulnerable to melting, scratches, and knife cuts although such problems can be addressed. Our collection of Encore Acrylic Worktops combines modern design looks with practicality for everyday use. 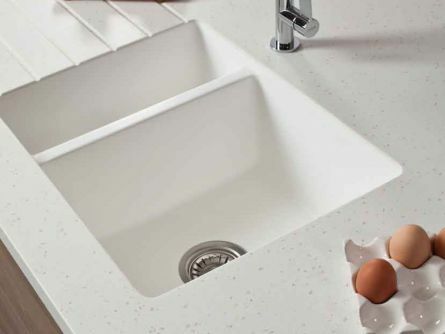 Encore worktops are unrivalled aesthetically and offer a solid surface kitchen worktop product that is durable and hygienic. From classic crystal designs to neutral colour tones, the range of products will give your kitchen a bold fashion statement that can last for years to come. You can also add in a stylish white acrylic sink that will be seamlessly moulded into your luxury kitchen worktop for a beautiful streamlined look. All products are manufactured in the United Kingdom and come with a fully supported ten-year guarantee. Without a doubt, wood is the most eco-friendly kitchen worktop option available on the market and is ideal for those seeking a warm and natural look. Timber kitchen worktops are available in a wide range of tones and grain patterns. Solid wooden kitchen worktops are incredibly hygienic with natural anti-bacterial properties. They are easy to clean and easy to repair. While such worktops are affordable, they do require routine maintenance. If not regularly maintained, these worktops can be prone to rust stains and may possibly blacken from contact with moisture. They can also be prone to scratching and scorching. What people love about solid wood worktops is that they suit all kitchen styles and can even be incorporated into contemporary schemes. They are ideally suited in dining areas and food preparation areas. 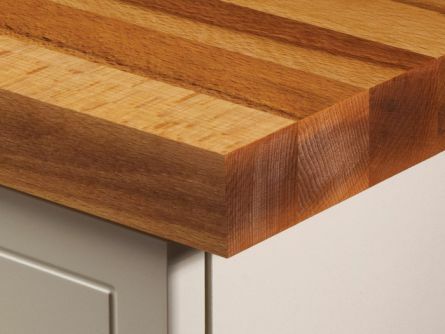 Dovetail Solid Wood Worktops enjoy a reputation as both beautiful and practical. With unique colours, patterns, and wood's anti-bacterial attributes, it's are one of the most hygienic materials available and ideally suited to most kitchens. The Dovetail brand offers the widest range of solid wood worktops in the United Kingdom. With proper care and attention, this durable material can easily last more than 100 years and is repairable by sanding. It is versatile and can be shaped to fit almost any space. These quality kitchen countertops are produced by a Danish manufacturer and include comprehensive instructions for seamless installation, care, and maintenance. 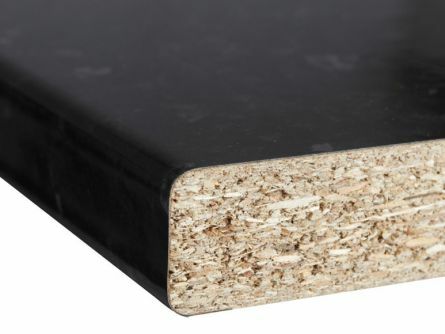 Dovetail kitchen worktops are economical and environmentally friendly. Providing your kitchen with a new look doesn’t always need to be complicated or expensive. Modern laminate products are one of the most accessible materials on the market that are inexpensive and made of good quality. In addition to being durable and easy to maintain, laminate can give you a stone, slate, marble, or wood finish without the heavy price tag that accompanies the natural product. With the variety of modern textures and colours available, they are customizable and versatile. They are also easy to maintain without any special chemicals required for cleaning. It is important to note that abrasive cleaning can cause marks in a laminate worktop as the surface is easy to cut or scratch. They are also not heat resistant. However, they are popular because you can get a fresh new look for minimal cost. With Lark and Larks’ extensive collection of laminate worktops featuring popular brands like Spectra and Tandem, you won’t have any problem finding the right product for you. Our collection of Spectra kitchen worktops offers a comprehensive range of textures, colours, and designs from intense granites to light woods. With textures like highly reflective gloss and soft brushed effects, you will have plenty of choice available to create your dream kitchen. Tandem kitchen worktops offer excellent value with a solid selection of textures and designs. The worktops are efficient and economical with each surface coming with a free half-length edging strip and guide for maintaining your worktop to ensure it lasts for years to come.